The FAA is planning to sign off on Boeing's software fix for grounded 737 Max planes on March 25, a source tells CNBC. The plane manufacturer tells CNBC the overall timeline has not changed. The report comes days after the FAA grounded all 737 Max flights, citing links between two fatal crashes. 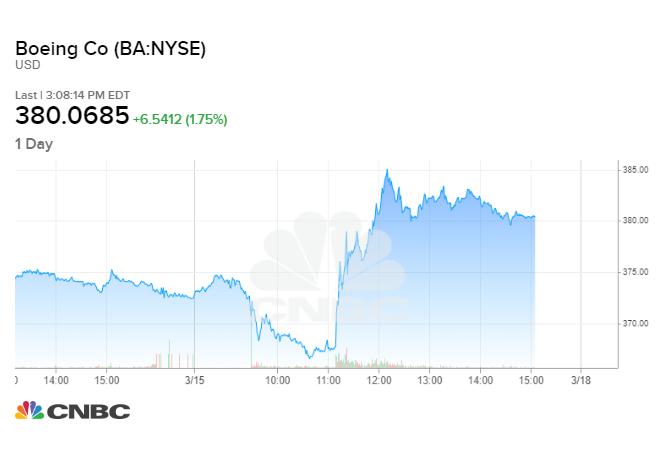 Shares of Boeing rebounded Friday after a report that the plane manufacturer plans to roll out a software upgrade for its 737 Max aircraft in 10 days. The Federal Aviation Administration is expected to sign off on Boeing's planned changes to its anti-stall software on March 25, a person familiar with the matter told CNBC. Lawmakers have been informed of the timeline, the person said. The approval of the software change does not necessarily mean that the FAA's order to ground the planes will be lifted, added the person. French news agency Agence France-Presse, citing sources, earlier reported the time-frame for the fix. Boeing told CNBC the overall timeline has not changed. The FAA on Wednesday followed dozens of other countries in grounding Boeing 737 Max planes, citing possible links between two fatal crashes in the past nine months. On Sunday, an Ethiopian Airlines Boeing 737 Max 8 crashed shortly after takeoff, killing all 157 people on board. That came less than five months after the crash of a Lion Air Boeing 737 Max 8 flight from Jakarta, Indonesia, which killed all 189 people on board. Both planes were new, delivered from Boeing just months before those flights. Boeing's stock fell more 10 percent this week in the aftermath of the Ethiopia crash. The plane manufacturer's shares rose roughly 3 percent Friday afternoon following the AFP report, and closed up 1.5 percent at $378.99. Investigators have indicated that the Lion Air pilots battled an automatic anti-stall system that comes with the 737 Max planes that wasn't included in older models. Before it grounded the Boeing 737 Max planes, the FAA had said it would mandate a software fix by April and said Boeing was developing other updates to pilot training and manuals. A weeks-long turnaround for Boeing would come much sooner than some on Wall Street had estimated. Bank of America predicted this week that it would take the aircraft manufacturer three to six months to "certify the fix." Of the more than 350 Boeing 737 Max jets in global fleets, 72 are flown by U.S. airlines United Airlines, American Airlines and Southwest Airlines. — CNBC's Meghan Reeder and J.R. Reed contributed reporting.